For the second time this fall we're hearing of a cluster of severe adenovirus infections involving fatalities (see last month's Heath Dept. Reports A Cluster Of Severe Adenovirus Cases In Upper Michigan) - this time striking children at a nursing and rehabilitation facility in Haskell, NJ. Adenoviruses - of which there are more than 4 dozen serotypes - are a common cause of (generally mild) respiratory illnesses in both adults and children. According to the following statement by the New Jersey DOH, 18 pediatric cases have been reported at this nursing facility, resulting in 6 deaths. The Department of Health today is confirming 18 cases of adenovirus among pediatric residents at the Wanaque Center for Nursing and Rehabilitation in Haskell. Of these 18 cases, there have unfortunately been six deaths of pediatric residents. A Department team is at the facility today and an inspection team was also there Sunday. The team on Sunday found minor handwashing deficiencies and the Health Department is continuing to work closely with the facility on infection control issues. This is an on going outbreak investigation. 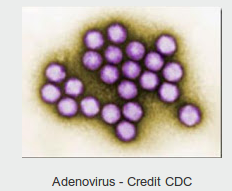 Adenoviruses are a family of viruses that often cause mild illness, particularly in young children. Unfortunately, the particular strain of adenovirus (#7) in this outbreak is affecting medically fragile children with severely compromised immune systems. The strain has been particularly associated with disease in communal living arrangements and can be more severe. 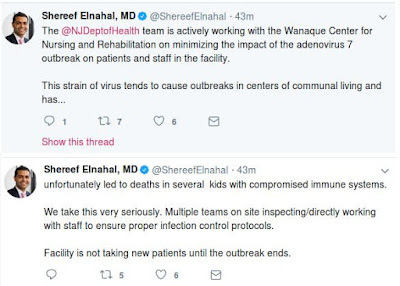 Less than an hour ago, the Commissioner of the NJ Department of Health published the following on Twitter. The CDC's Adenovirus Outbreak's page lists Adenovirus 7 as commonly associated with acute respiratory infections. Outbreaks of adenovirus infection can occur throughout the year. They are usually associated with respiratory illnesses or conjunctivitis.